"Do you remember the first time you saw a dinosaur?" 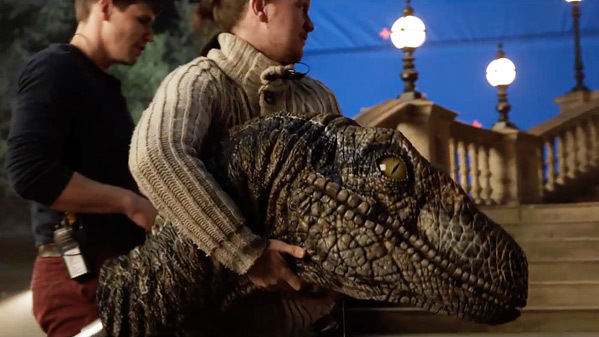 Universal has unveiled a behind-the-scenes video to build up hype for the trailer release this week of the sequel Jurassic World: Fallen Kingdom. This continues the story and follows characters introduced in Jurassic World, the current reboot of the Jurassic Park sci-fi dinosaur park series. The plot involves the group going back to Isla Nublar to try and save some dinos before a volcano eruption takes out the entire island. Chris Pratt and Bryce Dallas Howard return again, with a cast including Jeff Goldblum, BD Wong, Toby Jones, Ted Levine, James Cromwell, Geraldine Chaplin, and Rafe Spall. This promo borrows from Star Wars' marketing playbook by giving us an exciting behind-the-scenes look at the new movie, along with a glimpse at some footage. Trailer soon. Set several years after Jurassic World, this sequel is about a volcano on Isla Nublar that threatens the dinosaurs that had overrun the park. Dino trainer Owen Grady and former park manager Claire Dearing return to figure out how to get the dinosaurs off the island safely. Jurassic World: Fallen Kingdom is directed by acclaimed Spanish filmmaker J.A. Bayona (follow him on Twitter @FilmBayona), of the films The Orphanage, The Impossible, and A Monster Calls (also known as 7 Minutes After Midnight) previously. The screenplay is written by Colin Trevorrow & Derek Connolly; based on the characters created by Michael Crichton. Universal will release Bayona's Jurassic World: Fallen Kingdom in theaters everywhere starting June 22nd, 2018 next summer. Who's excited for more dinosaur mayhem now? Follow @JurassicWorld.